Thanks to some great work by Justine, we now have a YouTube page! You can check it out at http://www.youtube.com/user/LifeJustIsFilm or watch our first batch of videos below. Enjoy! Over the last few days I've been spending time sketching out shots for the entire film. Almost right from the inception of the project I've had a pretty clear vision of what I want from the film stylistically, so it's been interesting to sit down and actually try to flesh those ideas out properly. I had some notes and sketches that I'd jotted down during the scriptwriting phase, and it's been interesting to revisit them. Some of them were good, some of them were corny, and some were simply no longer relevant to the latest draft. Even though my new ideas have stayed true to my original intentions, I feel like the style has evolved and developed over the last few weeks. In putting together the talk I wrote about previously, in which I outlined my ideas to the crew, I was forced to really think my ideas through, and having to articulate them in that way was certainly a helpful part of the process. I feel good about my ideas, though I know there's room for improvement. Tomorrow I'm going to meet with Yosuke and Murat to talk through the film, shot-by-shot, and make sure we're covering all the scenes in the best possible way. It's great that I'm able to include Murat in this process, as having his input and advice (from both an editor's and a filmmaker's perspective), means that we can go into the edit room prepared. 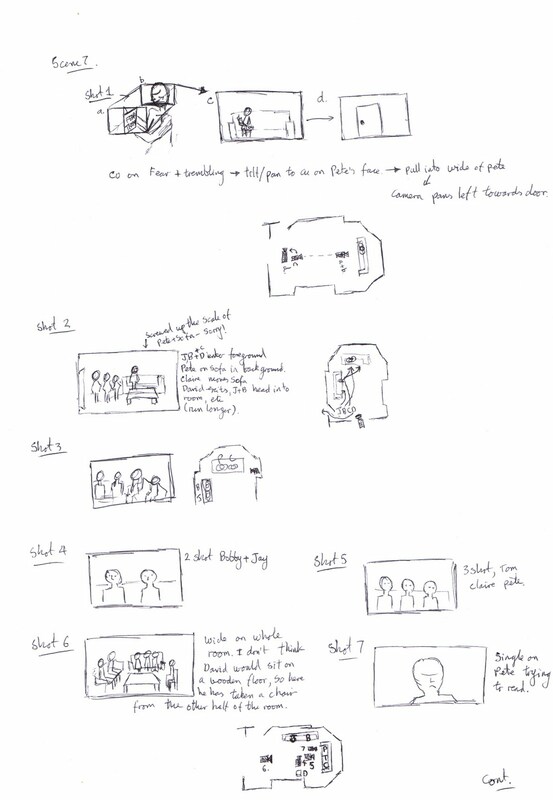 I always think about editing when I sketch out my films, cutting the shots together in my head as I draw them out. 'Life Just Is' will be understated and naturalistic, shot largely in long tripod-based takes punctuated by carefully planned camera movement. The editing pace will be meditative, while the soundscape will be calm and unaffected with little use of non-diegetic music. By using this style, the film will go beyond the realm of surface narrative and delve directly into the lives of its characters. As anyone who knows me knows (and no doubt much to my crew's dismay), drawing isn't my strongest point – but I wanted to include one page of my sketches to give you an idea of my process. After the meeting tomorrow these sketch pages will be turned into an illustrated shot list. Whether the images are redrawn or not will depend on time and how many changes we make to them. We're still fairly early on in this process, so no doubt there will be many – starting tomorrow. We are very pleased to announce that we have now recast the role of David with actor Will De Meo! His details are below, along with Hannah's, for those of you who have not yet seen them over on our website. The crew at the meeting (l-r): Jason Creasey (sound), Yosuke Kato (cinematographer), Lisa Smith-Milne (makeup artist), Alice Caronna (1st AD), Emily Lomasney (production manager), Niina Topp (production designer), Charmaine Parram (costume designer), Alex Barrett (writer/director). Yesterday Yosuke, Murat and I went to visit Concept Cameras to do some camera tests. There's a certain look that we want for the film so we thought we'd try out several cameras and a range of lenses to see how we can best achieve it. There are still a few points we have to think through, but the tests were hugely helpful and we now have a definite idea of what our options are (and the pros and cons they bring with them). So many thanks to Agis for letting us come and have a play! After we left Concept we had a long talk about lighting. Lights are expensive and our budget is small, but the ideas are coming together and we're already planning ways to work around our financial limitations. 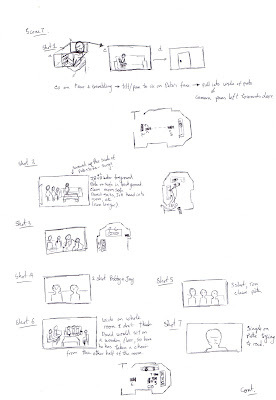 Once the script is rewritten I'll start working properly on the storyboards so can solidify our lighting plans. The cast read-through. 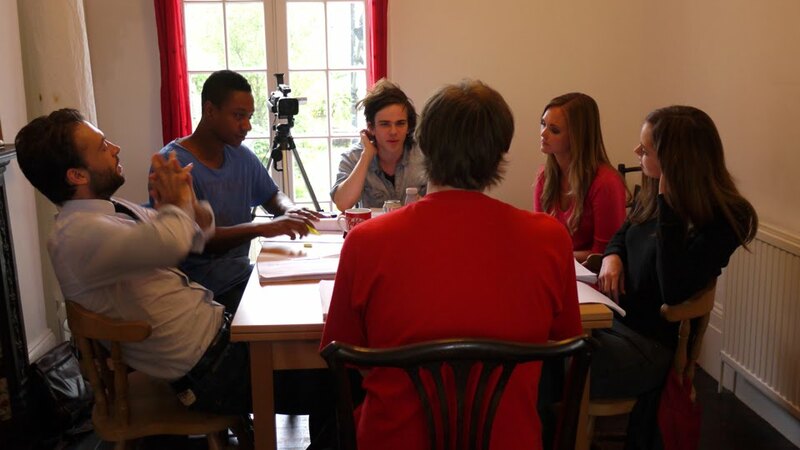 Left to right: Paul Nicholls (Bobby), Nathaniel Martello-White (Tom), Jamie Di Spirito (Pete), writer/director Alex Barrett, Jayne Wisener (Jay), Hannah Tointon (Claire). It's been a crazy few weeks, but it's a very exciting time and we are inching ever closer towards making this film a reality. Enough funding has fallen into place for us to make the film, and our shoot dates are now set. As is always the case with these things, this fantastic step forward for the project came with a downside: due to scheduling conflicts Jenna-Louise Coleman, Joel Dommett and our original cinematographer Bartlomiej Sienkiewicz have had to step away from the project. They have all been very supportive towards the film and I'd like to publicly thank them for their time and enthusiasm, and wish them the best with their new ventures. As the eagle-eyed amongst you will have already noticed from the updated crew-list on our website, we wasted no time in finding a new cinematographer, and I'm very pleased to say that the very talented Yosuke Kato has taken on the role. I've brought him up to speed with the project and I think we're going to make a great team. If we can pull off the things we're talking about then this film is going to look amazing. Yosuke is not the only new crew member, and I'm very excited about the fantastic team that we've been able to assemble for the film, who include Production Manager Emily Lomasney, Production Designer Niina Topp, Costume Designer Charmaine Parram, Makeup Artist Lisa Smith-Milne and our online social marketing superstar, Justine Priestley. Equally exciting to all this is our new Claire: I'm very pleased to announce that actress Hannah Tointon has joined our cast. As the read-through yesterday proved, Hannah is fantastic in the role and a real pleasure to work with. It's brilliant to have her on board and once the film is done I know you'll all understand why I'm so excited. All the cast gelled so well at the read-through that I can't wait to get this film on screen so I can share it with you. I'd always imagined that it would take us weeks to get to the stage where the actors shared with each other in the way that the characters do in the script: instead it took minutes. There was a real generosity of spirit in everyone that I found infectious. Their input into the script and the characters (both through ideas for script tweaks and performance) is going to take this project to the next level. A character piece such as this was always going to live or die by the quality of the actors involved, and based on what I saw yesterday we are very much alive. 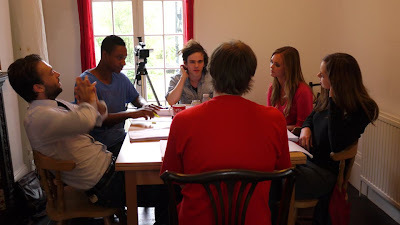 The cast after the read-through. Left to right: Paul Nicholls (Bobby), Nathaniel Martello-White (Tom), Jamie Di Spirito (Pete), Jayne Wisener (Jay), Hannah Tointon (Claire). The read-through was very swiftly followed by a crew meeting (yesterday was something of a mammoth day, it's safe to say). I subjected everyone to an hour and half of me droning on about the style of Life Just Is as I see it. I talked and showed some clips and images from films which I think serve as references. I like to work collaboratively with my crew, so the idea was to try and explain my vision for the film in more detail: that way we're all on the same page and everyone can input ideas which lead in the same direction. There's certainly a lot of work for us to do in the next few weeks as we lead up to the shoot. But after yesterday I am feeling extremely energised and ready to face the challenge head-on.